The country is on hold today as Marie Louise Coleiro Preca becomes Malta’s ninth President. The Malta Independent will be keeping you constantly updated on the six-hour swearing in ceremony, that will take Ms Coleiro Preca from Luqa, to Siggiewi, Qormi, Valletta and, finally San Anton Palace. Photos by Jonathan Borg and Michael Camilleri, video by Paul Jones. 20.08 - Prime Minister Joseph Muscat and Opposition Leader Simon Busuttil have paid visits to the new President in San Anton, concluding the six-hour long swearing-in ceremony. Ms Coleiro Preca, however, cannot rest just yet as she is scheduled to appear on TV later on this evening. 1957 - Marie Louise Coleiro Preca arrives at San Anton Palace - her official residence for the next five years. The new President is introduced to the Palace staff. 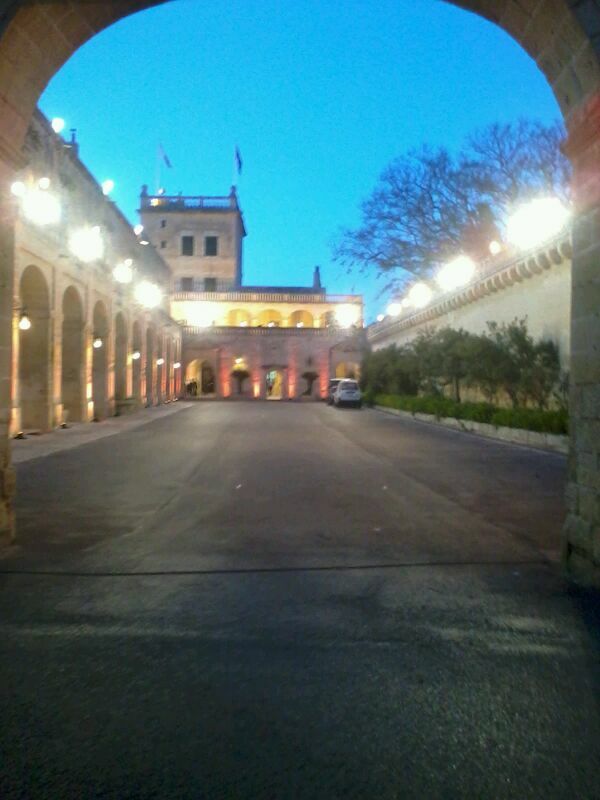 1941 - Meanwhile, everything is ready at San Anton Palace to host the new President. 19.36 - President arrives at War Memorial. 19.28 - The AFM's Air Wing salutes the new President with a flypast by two King Air B200 aircraft and two Aloutte III helicopters. This concludes the ceremony at the Palace. 19.25 - The President inspects the AFM guard of honour. Members of the public applause from behind the barriers set around the square. 19.21 - President Marie Louise Coleiro Preca walks out into St George's Square and the national anthem is played. Nine renowned singers are singing the anthem, accompanied by the AFM band. 18.57 - President signs the appointment letter as Head of the Xirka Gieh ir-Repubblika and the National Order of Merit together with the conferment of Companion of Honour of the Order. 18.53 - President Coleiro Preca returns to the balcony together with Prime Minister Joseph Muscat, Opposition Leader Sion Busuttil and Alternattiva Demokratika Arnold Cassola. 18.50 - President Coleiro Preca greets members of the public from the Palace balcony. 18.25 - President Coleiro Preca reads the proclamation and swears loyalty to the constitution and the country. Prime Minister Joseph Muscat countersigns the proclamation. The new President will now make a speech. 18.22 - Artillerymen from the AFM's 1 Regiment are now firing a 21-gun salute from 4 guns in Fort St Elmo. 18.21 - Marie Louise Coleiro Preca takes the oath - she is now Malta's ninth President. 18.15 - Speaker Anglu Farrugia suspends the Parliamentary sitting for a few minutes until the President is escorted to the Pages Room, where he will meet with Marie Louise Coleiro Preca. 18.10 - President Abela arrives at the palace square, escorted by eight police cavalrymen. He is now inspecting the guard of honour for the very last time. Breaking off from protocol, Dr Abela shakes hands with well-wishers before heading to the palace. 18.02 - Prime Minister Joseph Muscat and Brigadier Jeffrey Curmi arrive at St George's Square. 17.56 - In the meantime, guests are waiting in the Grand Council Chamber. Former Prime Ministers Lawrence Gonzi and Alfred Sant are seated next to eachother. 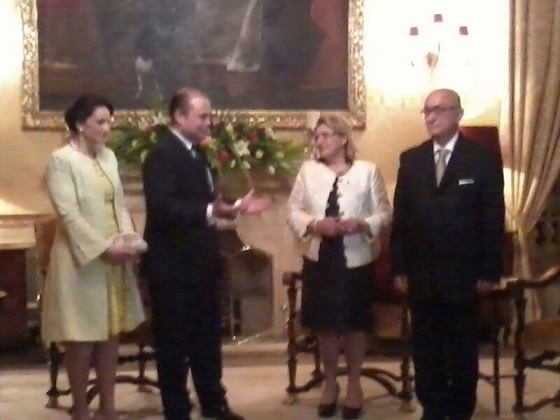 17.55 - Ms Coleiro Preca arrives at the Palace, where she is greeted by Speaker of the House Anglu Farrugia. President Abela will arrive in St George's Square shortly. 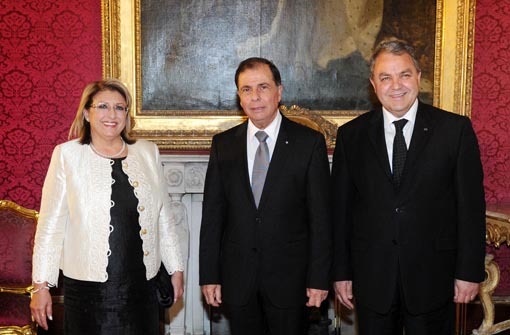 17.44 - Dignitaries are still arriving at the Presidential Palace, a few minutes ahead of Ms Coleiro Preca. She will take the oath of office at around 18.15pm. At the moment she is still walking down Republic Street, shaking hands with people and lifting children. A number of tourists are also present, bemused by the event. 17.33 - The President-in-waiting was joined by schoolchildren in front of the Royal Theatre and is walking down Republic Street, holding hands with her husband Edgar. Hundreds have turned out to greet her. The AFM band marched down the road a few minutes earlier. 17.14 - Ms Coleiro Preca has just arrived in Valletta. She will walk down Republic Street, accompanied by some 400 schoolchildren. On her way to the Palace, she will pass by the Social Solidarity Ministry, her workplace for the last thirteen months. 17.09 - In the meantime many people are now lining both sides of Republic Street. Ms Coleiro Preca will walk down the sreet and greet well-wishers on her way to the Palace. 17.07 - Dar tal-Providenza has just issued a statement, thanking Ms Coleiro Preca. “Id-Dar tal-Providenza has more than appreciated the fact that before she proceeded to take the oath of Office as the newly elected President of Malta, the President elect, Mrs Marie-Louise Coleiro Preca chose to have the “Mass of the Holy Spirit” under a big tent in the car park of our Home in Siggiewi for which around a thousand and four hundred people were present. Director Fr Martin Micallef said that the choice of Id-Dar tal-Preovidenza as the venue for the Mass demonstrates her wish to strive for a Maltese society that is more inclusive, fair, and equal, a society which is supportive with those who are in need of support, a society that has the vulnerable at heart and looks at differences not as a threat but as something beautiful. We welcome the newly elected President, Mrs Marie-Louise Coleiro Preca and thank her for the support she gave us in the past as Minister and that she showed she will continue to provide during her Presidency. 16.54 - Ms Coleiro Preca has just arrived at the St Sebastian parish, where she is once again barely visible in a huge crowd, with many poeple waving Maltese flags. 16.47 - Our newsroom has just been informed that some people are actually letting off fireworks in Qormi in honour of the new Preident. Bands are also playing festive tunes. 16.35 - Marie Louise Coleiro Preca has just arrived at St George's parish in Qormi, a few metres away from her constituency office. Police are holding people back as some rush towards her car. 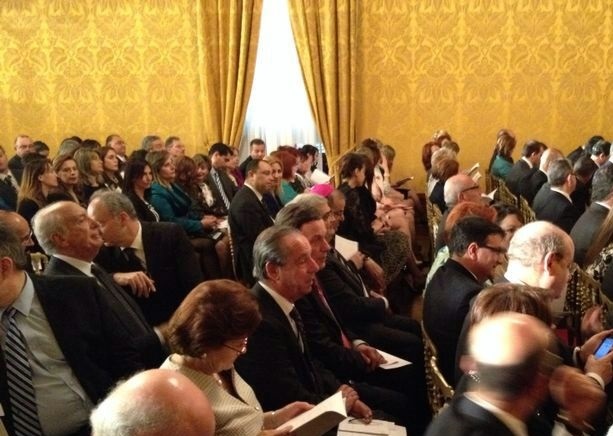 Ms Coleiro Preca is hardly visible as she is surrounded by members of the public. In fact, she stands afoot her car so that everyone can catch a glimpse of her. 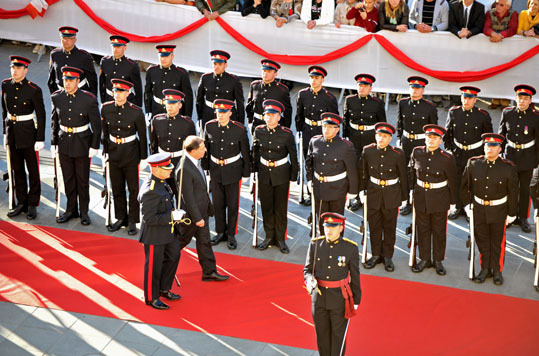 16.33 - An AFM guard of honour will latter accord a national salute to President George Abela and later on in the evening to the new President, Marie Louise Coleiro Preca. Armed Forces helicopters and planes wil also conduct a fypast over St George's Square and a 21-gun salute will be fired from Fort St Elmo. 16.27 - The President-in-waiting was earlier welcomed in Siggiewi square. She is now on her way to her hometown, Qormi. Ms Coleiro Preca will visit both St George and St Sebastian parishes. In the meantime, final preparations are underway at the Presidential Palace in Valletta. 16.11 - In comments to TVM, Dr George Abela says he now looks forward to spend more time with his family and give a helping hand at his son's legal office. 16.09 - Ms Coleiro Preca and her entourage are now heading toward Siggiewi square where a crowd is patiently waiting for her arrival. 16.01 - The Archbishop blesses a Maltese flag presented by representatives of the political parties. The flag will be flown over San Anton Palace. 15.25 - During homily, Archbishop Paul Cremona notes that Ms Coleiro Preca chose Dar tal-Providenza for celebrating mass as a symbol of the direction she wants to give to her Presidency. 15.15 - Archbishop Paul Cremona is leading the ceremony. The First Reading was read by Daniel Cassar, a nephew of Ms Coleiro Preca, Psalm was read in braille by Maria Munro and the Second Reading was read in sign language by Melissa Aquilina. The Gospel was read by Father Gordon Refalo from Luqa Parish. 15.00 - The final guests to arrive are President George Abela and his wife, Margaret. They are also given a big round of applause. 14.59 - Prime Minister Joseph Muscat and wife Michelle arrive at Dar tal-Providenza and are greeted by the Director, Fr Martin Micallef. 14.56 - The President-in-waiting enters the venue to a huge round of applause and a choir singing in the background. Mass will be concelebrated by priests coming from localities forming part of the sixth electoral district. 14.46 - Marie Louise Coleiro Preca arrives at Dar tal-Providenza. The tent under which mass will be held is now packed. Up to 1,200 guests will be attending the religious ceremony. 14.33 - Ministers, MPs and other guests are arriving at Dar tal-Providenza in Siggiewi where mass will be held at 3pm. President Emeritus Eddie Fenech Adami and former PM Lawrence Gonzi are among the guests. President George Abela and Prime Minister Joseph Muscat are expected to arrive shortly. 14.20 - Ms Coleiro Preca leaves for Siggiewi, a full 15 minutes earlier than programmed. She did arrive in Luqa earlier than expected, though. The huge crowd that was expected to fill the Luqa square did not materialise. 14.09 - Motorcade arrives in Luqa, where people have been waiting for some time. Police are struggling to hold back people who are trying to push forward to speak to Ms Coleiro Preca. 14.00 - People are gathering in Luqa, waiting for the arrival of the new President. Many are carrying Maltese flags. 13.50 - Wearing a cream coloured dress, Ms Coleiro Preca appears outside her home in Balzan. "I love you all," she tells members of the public, accepting bouquets of flowers. "I want to be a President for the people."